Going snorkeling with a full face snorkel mask makes you realize how old regular masks and snorkels are. 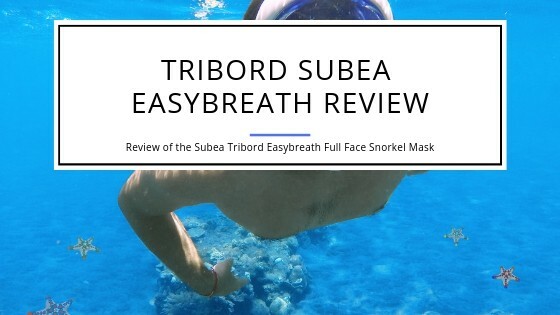 The market leader is the original full-face snorkel mask, the Tribord Subea Easybreath. Formerly the mask was referred to as Tribord Easybreath. Since the 2017 model was introduced that had some improvements, the name also got changed to include the Subea name. It looks like the marketing is going to switch away from the Tribord name towards the Subea name. You can probably expect soon to have this mask only be sold as the Subea Easybreath mask. 1 What makes the Tribord/Subea Easybreath so enticing? 5 Dry Snorkel or not? 9 Hair in the way! 11 How do you take care of your Subea Easybreath? 12 What things is the Easybreath not so good at? 14 Is the Subea/Tribord Easybreath worth getting? 15.1 What is the best snorkeling mask for full face? 15.2 Can you go underwater with a full face snorkel mask? 15.3 Is a full face snorkel mask better? 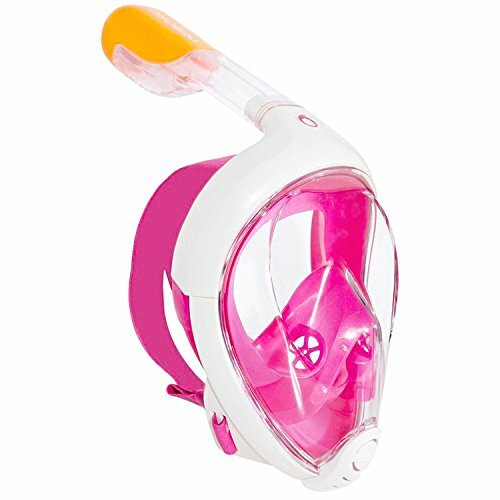 15.4 What is the best full face snorkel mask for kids? Since the first introduction of the then Tribord Easybreath mask, there have been some improvements made. The most significant was to use a hypoallergenic silicone skirt. A skirt is the soft silicone strip that seals the mask against your face. Other improvements include better air circulation inside the mask through improved air valves. This enables you to breathe more comfortably and also helps with preventing fogging of the goggles when you’re using them. Lastly, the snorkel itself has been improved. The latest model as an improved locking mechanism for the snorkel so it won’t be able to detach from the mask accidentally. Subea markets this as the Secure Lock Snorkel with a Dry Freak O-Ring. The lifecycle of the O-ring is rated to be about six years, and the mask comes with a replacement ring. When you look online or in a store, you might still find older versions of the mask for sale. There’s nothing wrong with those models at all and if you only occasionally go snorkeling and you get a better price on the older models then go for it! What makes the Tribord/Subea Easybreath so enticing? During the introduction of the upgraded model, you could also get a few different limited edition prints. These can often still be found even though they are officially not available anymore! They have patterns printed around the mask to make them stand out. If you can find them, you will have to expect to pay more than for the standard model. Once they get harder to find you also will have to assume that prices will increase even more. All kidding about color aside, most important, you can breathe naturally. What stops many people from making snorkeling their hobby is that they can’t breathe naturally through their nose. Even worse, if you rent a traditional mask and snorkel, you end up putting the snorkel mouthpiece into your mouth where you don’t even know how used it before. While it is (or should be) cleaned and disinfected, it’s still not a pleasant thought for many. Not having a mouthpiece results in a lot less stress for your jaws. You don’t have, and your jaws won’t experience any fatigue. This way you can snorkel for much more extended periods of time without getting tired from the continuous clamping down on the mouthpiece. One of the great features of the Tribord/Subea Easybreath is how the air is flowing inside the mask. The design is so intelligent that it continuously has air flowing along the lens which in turn results in a fog-free snorkeling experience. Many traditional goggles at one point or another will start to fog. If that happens, you have to get your head out of the water, take the mask off and clean it. You won’t have to perform that exercise with the Easybreath as it is pretty much impossible to get it to fog up. The airflow along the lens prevents any condensation, and you’ll have a clear view. The airflow design is such that any fogging that could occur from exhaling is kept in the bottom part of the mask. There’s no visibility through that area so any fogging that happens will not impact your visibility at all! But that’s not the only thing. The other remarkable improvement of a full-face mask is that you get panoramic views. A regular snorkel mask restricts your visual area to pretty much straight ahead and a few degrees up and down as well as left and right. A mask that covers your whole face provides you with a 180-degree view in all directions. You can enjoy the sights underwater a lot more. A lot more people enjoy snorkeling that way as they don’t feel as restricted as with a regular mask. And for all that think that such a large mask must be prone to breaking: it’s not. The lens is made from shatterproof polycarbonate that is tough, and you’d have a tough time to find a way to break it. The snorkel is a dry snorkel. 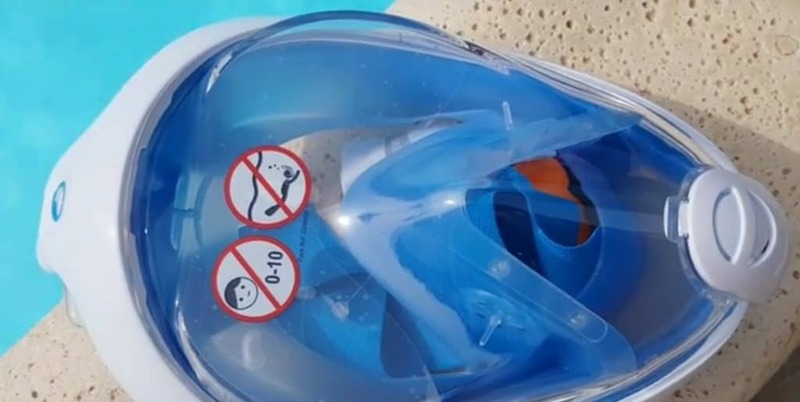 That means that even if you get the tip of the snorkel under water, there’s no water coming through the snorkel into the mask or your mouth. Dry snorkels are not exclusive to full-face goggles as you can get a traditional snorkel that is a dry snorkel. When you want to go snorkeling, then you want a dry snorkel. But that’s not all; you want a high-quality one. These are designed with excellent materials that will keep your snorkel dry for years to come. A dry snorkel uses a floating device in the tip of the snorkel. 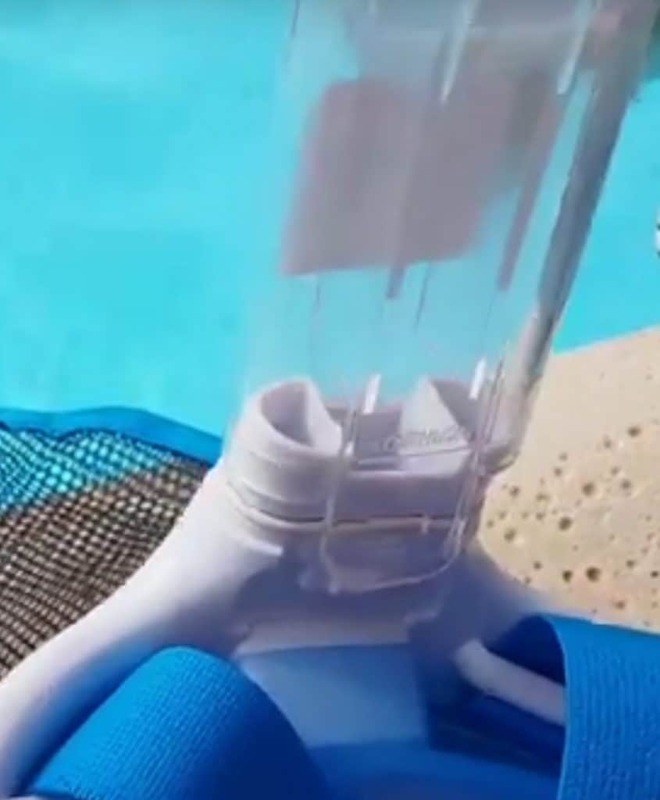 When the tip goes under water, the floating piece rises and closes off the tip of the snorkel. That prevents water from getting in while the tip is submerged. When the float seals the snorkel, you can’t breathe as long as you’re underwater. Once the tip gets above the water again, the float or ball sinks and opens the snorkel so you can breathe. You can breathe in and out regularly again, and you won’t have to blow any water out of the snorkel. The Subea Easybreath not only has a dry snorkel, but it also has a purge valve that is located in the chin area. If you ever have water get into the mask, then you can force the water out through the purge valve. There’s no need to take the mask off to drain it! You lift your head above the water, and the valve opens and lets the water in the mask drain. Looking at the mask, you can see that it is a little on the bulky side. Another great feature specific to the Tribord Easybreath is that you can detach the snorkel from the face mask. That reduces the overall size for traveling significantly! You merely put both parts into the mesh bag that comes with the mask, and you’re ready to go! With the 2017 upgrade there finally also came a way to mount a GoPro camera. And compared to other full-face masks, the engineers at Subea came up with a pretty smart solution. First of all, not everyone uses a GoPro or a similar video camera. There’s also no universal mount for such action cameras so having the mount be part of the mask could result in you not using the mount at all. The Easybreath designers came up with an easy to attach mount for the camera that clicks into the snorkel. It sits securely attached so you won’t lose your camera but can also easily be removed if you don’t use one. An overall pretty smart way to make the mask be usable with a GoPro camera. The mount is optional and is quite inexpensive if you wanted to get it. The video camera adapter positions the camera on top of the mask. That way your camera view is somewhat similar to what you see when you snorkel. That usually provides the best video capture while it also keeps your hands free from having to hold the camera. The problem with the adapter though is that the camera does end up obstructing your view on the top of the mask if you look up. Other masks with a built-in camera mount, like the Seaview 180 don’t have that problem. Another downside of the camera attachment is though that it can scratch the top part of the lens of your mask. It’s not very likely, yet it can happen. If you know that you will regularly use a video camera like a GoPro to film your snorkeling excursions, then you might overall be better off to use a mask with a built-in mount like the Wildhorn Outfitters SeaView 180. One of the huge advantages of the Tribord Easybreath over most of its competitors was that there were four different sizes available. This allowed finding a pretty perfect fit for nearly all face sizes and shapes. With the switch to the 2017 model and using the Subea name, the mask only comes in two different sizes. These two sizes cover around 90% of different facial sizes. Even kids above the age of approximately ten years should have no problem to have a great fit with the smaller size! Reducing the number of different sizes in the case of the Subea Easybreath does not have an adverse side effect. It makes sizing easier, and the introduction of the new mask skirt provides a tight fit for most faces even though there are fewer sizes available. You shouldn’t have an issue to find a perfect size match for your face. Another advantage of going to only two sizes is that the cost to produce the mask went down. And that resulted in the latest model being cheaper than the models before when you purchase one. The two sizes make it pretty easy to pick the right size. With the four available sizes, it was a little harder, and some people ordered a mask a size too large. In any case, it’s easy to measure for the right fit. While you keep your mouth closed you measure between the bottom of your chin to the bridge (top) of your nose. If the distance is less than 4.7 inches, then you need to get the smaller version of the goggles. Otherwise, you’ll go for the large size to fit your face. In any case, you want to make sure that there’s no gap between your chin and the bottom of the mask. The skirt of the mask should fit tight against your skin all around the mask. This tight fit is hard to achieve if you have a beard. The hair of your beard will often prevent a tight fit of the mask against your face, and the result is that some water can get into the mask. This is not a specific problem of the Tribord/Subea mask but is valid for all types of snorkel and scuba masks. A full face mask has an advantage over regular masks when it comes to you having a mustache as it still provides a tight fit in that case. A traditional mask will leak if you have a mustache. However, beard hair is not your only hair issue with a snorkel mask. If you have long hair or bangs and you don’t get them out of the way when you put the mask on then the effect is the same as if you have a beard. The hair will provide tiny openings between your skin and the mask, and that will allow water to get into the inside of the goggles. Putting on a large mask like the Easybreath seems complicated at first. It’s pretty easy. You have to make sure that your hair is out of the way. The straps allow adjusting the fit of the mask until it sits perfectly tight yet comfortable on your face. It’s easiest to keep the straps out of the way when you put on the mask. Place it straight onto your face until it fits tight. Make sure there’s no hair between your skin and the goggles. Then push the straps into their place and pull them tight. Putting the mask on straight from the front will usually reduce a chance that a hair gets caught between your skin and the skirt of the mask. If you slide the goggles from the top of your head, then you most likely will catch strands of hair that will prevent a watertight seal. How do you take care of your Subea Easybreath? It’s pretty easy to take care of the mask if you follow a few simple common sense guidelines. First of all, keep the mask away from sand and rocks. The lens of the mask is polycarbonate, and as such, it can scratch. Placing the lens into sand or onto sharp rock is a recipe for ending up with a scratched visor! If you’re on the beach, then place the mask with the lens pointing up into the sand, so it sits on the skirt. Use clean water (fresh water!) to rinse the mask after each time you snorkel. While water often looks clear, things are floating around, and any of that can lodge itself into crevices in the goggles or the snorkel. 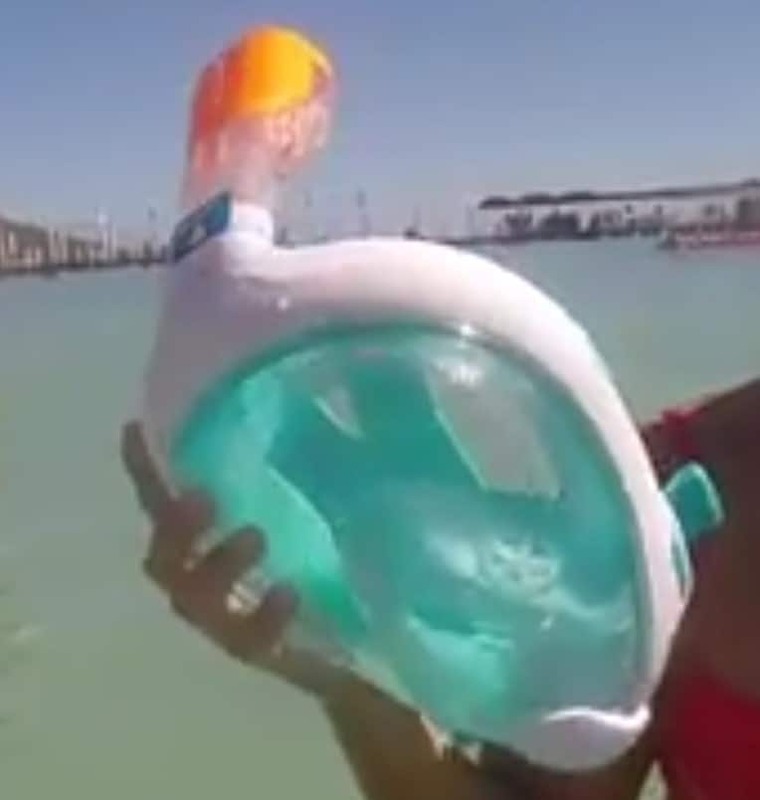 It can even get as bad as preventing the floating device in the snorkel from closing up the snorkel. So, rinse with fresh water after each use. If you want to be extra thorough, then clean again before you place the snorkel into the mask before you go snorkeling. Always rinse by hand and never place the mask into your washing machine or dishwasher. This most likely will damage your mask and render it unusable. Use the mesh bag that comes with the mask for storage and travel. The mesh of the bag provides ventilation and lets water drain out and away from the goggles. Keep the bag and mask out of extended periods in the sunlight. Sunlight can interact with the plastic of the mask and over time damage it. What things is the Easybreath not so good at? All full face masks trap a lot of air between your face and the lens. This large volume of air makes it hard to dive down underwater if you see something you want to explore further. This is not a specific issue of the Tribord/Subea Easybreath but is true for all large masks. Traditional snorkel and scuba masks are designed to trap the least amount of air possible inside the mask. This way you don’t have to fight the natural buoyancy of that air when you want to dive down. It’s also not like it’s impossible to dive down a few feet to explore the underwater world a little while you snorkel. It is pretty much useless though if you wanted to use the mask for freediving instead of snorkeling. The depths you try to reach with freediving will undoubtedly be too much for a mask with such a high amount of air trapped inside. The dry snorkel is also only dry if you keep the mask mostly horizontal. If you try to deep dive, then the floating device in the snorkel is in the wrong position and won’t effectively close up the snorkel. The result, in that case, is that water will enter into the mask through the snorkel. Again, the mask is designed for snorkeling and not for deep diving! Is the Subea/Tribord Easybreath worth getting? We’ve listed the good and bad in our review above. At this time it’s pretty clear that there’s not many if any negatives with the Tribord Easybreath at all. If you’re looking for a full face snorkel mask, then it honestly doesn’t get better than this! Our only caveat is if you regularly want to use your GoPro (compatible) camera. If that’s the case, then have a closer look at the Wildhorn Outfitters Seaview 180 Degree mask. It has a built-in, perfectly positioned GoPro mount. The Seaview is comparable in quality and features yet has the mount for the camera in an overall better position. If the GoPro mount is not your primary concern, then the Easybreath is the best mask for you. It combines outstanding design features with highest quality materials to provide you with a long-lasting snorkel mask for years to come. The Easybreath and the Seaview 180 are certainly not the only masks available today. If you are interested in other top-rated full-face snorkel masks then check out our post comparing the best of them! 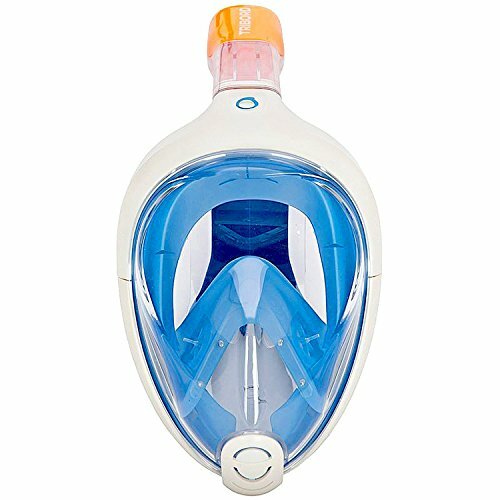 What is the best snorkeling mask for full face? There’s no straight answer to that. We’ve evaluated a number of full face masks over the years and through all that time the Easybreath kept it’s place on one of the top spots. 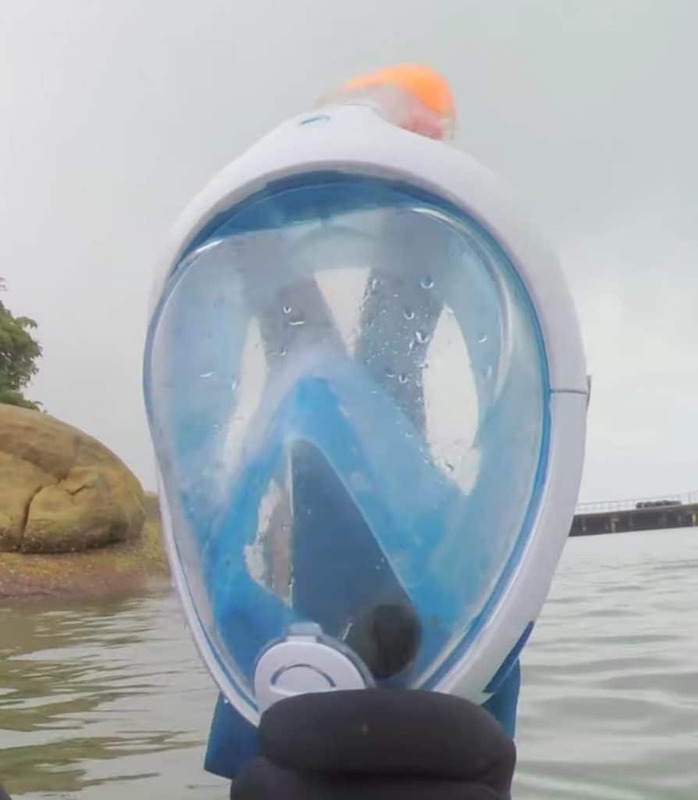 Can you go underwater with a full face snorkel mask? The short answer is ‘yes’. However, these masks are not designed for diving! They are pretty large which results in a lot of air being trapped. This makes going underwater harder as the trapped air will want to push upwards. The snorkel on the Easybreath and other such snorkel goggles is dry. However, if you dive straight down, the mechanism to close the snorkel won’t work that well and water can (will) get into your mask. Is a full face snorkel mask better? No mouthpiece – you can breathe naturally without having to clamp down on a snorkel mouthpiece. This prevents jaw fatigue and makes it a lot more relaxing. Keeps your face dry – The mask covers your whole face. If you only snorkel occasionally then it can be a lot more pleasant than to have the water touch your face. 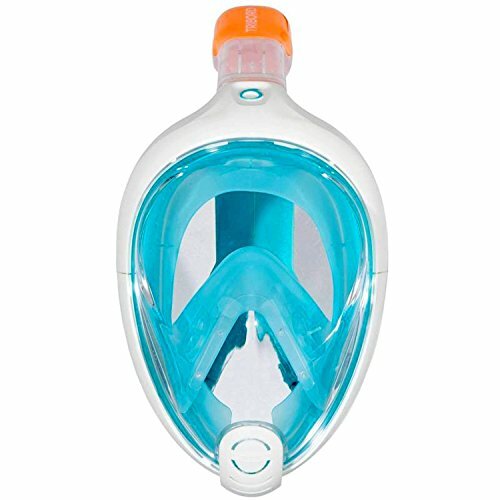 What is the best full face snorkel mask for kids? Similar to there not being a single best version for adults, there’s also not a single best one for children. We’ve checked and evaluated the most common and sought after masks for children.